Every Saturday morning, Historicist looks back at the events, places, and characters—good and bad—that have shaped Toronto into the city we know today. 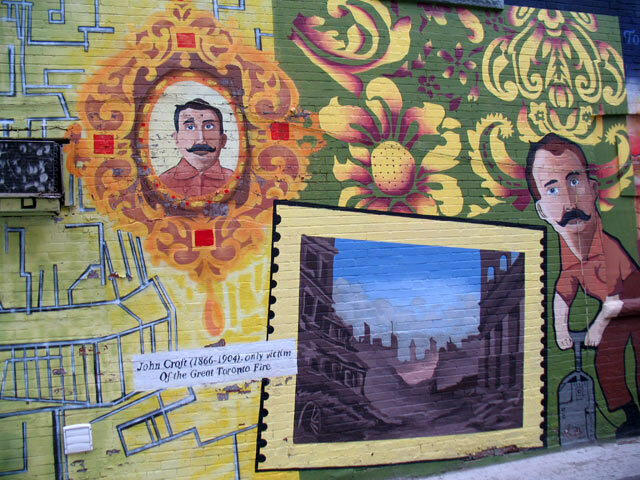 One of the most eyecatching murals on display in Toronto is the colourful piece that acts as a gateway to Croft Street near College and Bathurst. 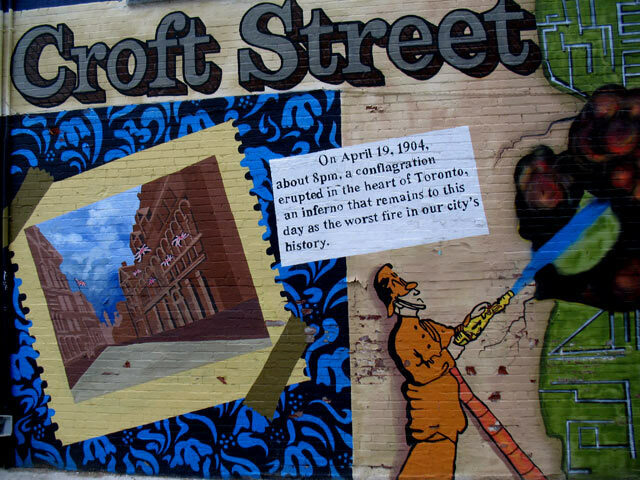 The Monty Pythonesque design may provoke chuckles but the story it relates is a serious one, as the work honours the street’s namesake, the only recorded fatality associated with the Great Toronto Fire of 1904. On the evening of April 19, 1904, a nightwatchman noticed flames in an elevator shaft of the E&S Currie Building at 58-60 Wellington Street West. Unfortunately, most of its neighbouring buildings were made of highly flammable wood and designed in ways that fueled fires. The blaze quickly spread and cut a 12-hour path of destruction roughly bounded by Simcoe, Melinda, Yonge and the rail lines. Firefighters from as far as Buffalo assisted Toronto firefighters, with teams from London and Peterborough arriving too late to battle the flames. By 4:30 a.m., the fire was declared to be under control. Insurance companies and city inspectors quickly assessed the condition of the damaged buildings and prepared a list of properties deemed too unsafe to remain standing. Property owners received notices asking them to bring down their walls immediately or allow the city to demolish the structures. No objections were received. 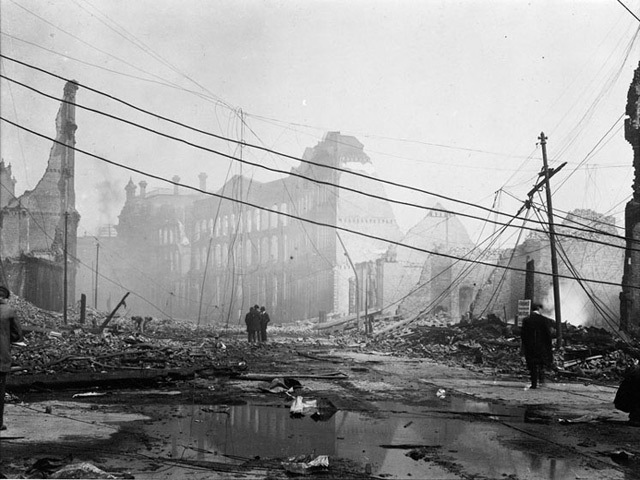 Over the next few weeks, safecrackers were hired to rescue important documents from the ruins, followed by demolition teams equipped with dynamite. Among the men hired for the demolition was Parliament Street resident John Croft, a recent immigrant from England who had occasionally assisted dynamiters in coal mines in his native land. He was assigned to the W.J. Gage Building at 54-58 Front Street West. His team was not given a storage battery to set off the dynamite and had to resort to lighting long fuses then running for cover (an image associated with modern cartoon gags—a possible inspiration for the mural design?). This worked for the first two explosions that were set on May 4th. The third try proved unlucky for Croft. Croft, with two assistants, William Goudge and A. Ramsden, had set off 30 blasts yesterday morning and at 1 o’clock placed three charges under of portion of the W.J. Gage & Co. wall. Two were exploded safely, but the third fuse, set for a minute and a half, was slow. After waiting for some time, Croft went up the wall to investigate, and as he did the blast went off. The flesh on his right arm was torn to shreds, and he sustained a severe scalp wound and a broken rib. The sight of the left eye was destroyed. Later that morning Croft died from the shock, leaving behind a wife and three children. He was buried in Mount Pleasant Cemetery. Four years later, the former Ulster Avenue was renamed in his honour. 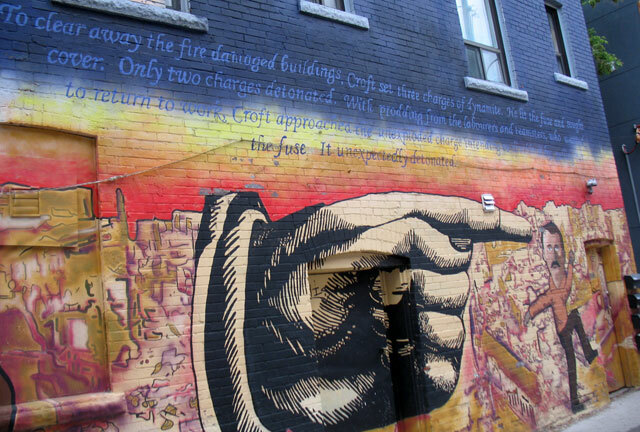 The mural was created a century later, followed by a plaque from Heritage Toronto. Photos of Croft Street by Jamie Bradburn. Additional material from the May 5, 1904 edition of The Globe.